Shirt Factory Directory: CMT Factory Directory Polo Shirts, denim shirts, casual shirt etc. Before you research factories producing shirts, you may want to take a few moments to learn about the different type of shirts from our fashion industry terminology section. If you are searching for shirt factories you have come to the proper location. 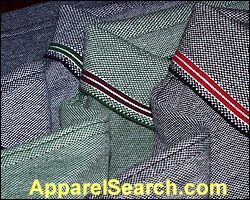 Below you will find our shirt manufacturers directory. This is an international apparel guide with listings from various countries. Manufacturer Item # 2: Necktie-silk woven/printed; polyester woven/printed. Manufacturer Item # 7: Scarf-process with supplied sample. Categorized factory guide: T-Shirt Factories, Blouses Factories and Dress Shirt Factories. Thank you for taking the time to utilize our fashion industry guide to learn about shirt factories around the world.